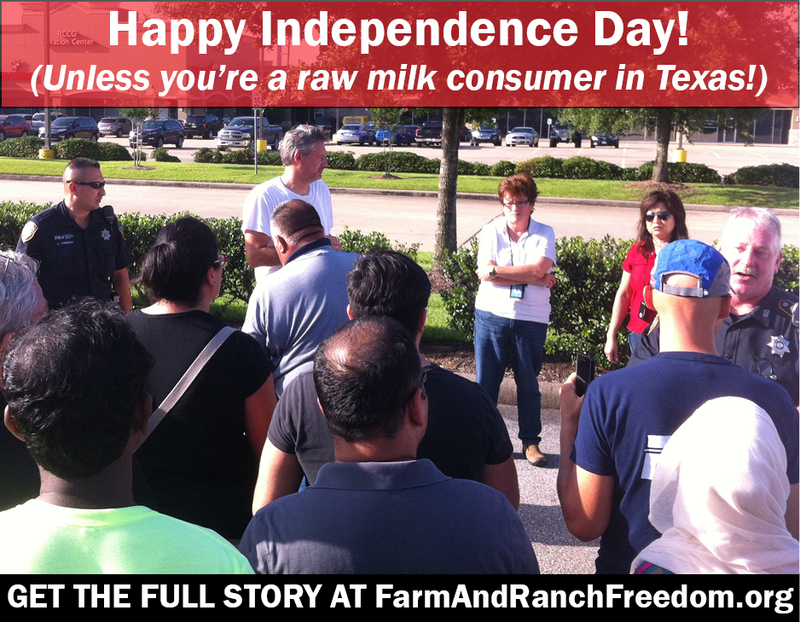 During the Independence Day weekend, the Harris County Health Department pulled Sheriff’s deputies away from a domestic dispute in order to bust a raw milk drop point. This raid targeted adults who were picking up raw milk, purchased from a licensed, inspected farm, using a courier that they hired. To the Health Department, this apparently is a greater public concern than addressing domestic violence. The Health Department refused to allow people to take the milk for which they had already paid, and issued a citation to the courier, ordering her to appear in court next month. Just as in the similar incident in Austin, the department’s claim was that the courier needed to have a food establishment license, as is required of restaurants, food stores, and food trucks, for example. But if this is really what the law means, then UPS, FedEx, UberEats and other restaurant delivery services, CSA drop points, and volunteers organizing bulk purchases of any food are all operating illegally. And at the same time that they’re harassing raw milk farmers, DSHS has also tried to shut down every Texas producer who sells duck or quail eggs to restaurants or stores — because of the agency’s own badly written regulations. **Egg Update 7/11/16: DSHS has issued a guidance document allowing Texas farmers to sell duck & quail eggs without having the eggs graded (since there are no standards for grading non-chicken eggs in Texas). Farmers, small local food businesses, and their customers should not have to fear being shut down, fined, or faced with the police simply for trying to produce and access healthy, local food! Concerned about the police showing up at your door? Learn about your options. Why is this happening? Learn more about why these courier arrangements are legal and what is really behind these busts. Thank you to Representative Dan Flynn! He has written to the Texas Attorney General expressing his concern about what DSHS is doing and asking the AG to investigate. You can read his letter here. Call your State Representative and Senator and tell them to rein in the Department of State Health Services. While the agents at this latest bust were from Harris County, they explicitly stated that they were only enforcing the state regulations – and that a state inspector had told them that this was an illegal operation. DSHS previously tried to avoid responsibility for the Austin raid on May 26th, which also involved the police, but we received documents showing that a DSHS manager told the City of Austin health department that the “rogue dairy farmer” was doing “illegal deliveries” and that the courier had to be licensed as a food establishment under state regulations. DSHS is responsible for what is happening, and needs to be told to stop. Moreover, when combined with the recent crackdown on local producers of quail and duck eggs, it looks like the agency is becoming hostile to local producers more broadly. We are not giving you a sample script in this alert because this needs to be a personalized, individual call. It can be short — just a couple of minutes — but the legislators need to hear from their constituents. Are you a raw milk customer angry that you might be faced with law enforcement simply for buying milk? Are you a farmer whose business (milk or otherwise) has been hobbled by vague regulations and overbearing enforcement? Share your story, briefly, so that they understand how many people are being impacted. 1) Contact County Judge Ed Emmett at 713-755-4000 or by using the online contact form at http://www.judgeemmett.org/contact_CJO.asp. 2) Call your County Commissioner. Below is a list of the County Commissioners and their contact information If you aren’t sure what precinct you are in, you can find out at http://www.harriscountytx.gov. Just run the mouse over the different Precincts, and it will show a map of what parts of the County are represented by that Commissioner. Remember, sending an email is helpful, but calls have a greater impact. Having the Health Department and Sheriff’s Office interfere with people obtaining a legal food product – raw milk from a licensed dairy – is an appalling abuse of authority and waste of county resources. The Health Department doesn’t require UPS or FedEx to be licensed, even though they deliver food (including milk and other perishables) every single day from businesses like Amazon. The Health Department also doesn’t require food vending licenses by UberEats drivers or Eat Out In, just because the drivers are delivering food from restaurants. Harris County residents have every right to hire an agent to do anything that we could legally do — and picking up milk from a farm is no different. The Health Department’s irrational bias against raw milk is not a legal basis for harassing me or my agent. 3) Make plans to be in the courtroom on August 24! That’s when the courier has been ordered to appear before a judge, and face a fine for simply acting as an agent for other customers in picking up milk from a licensed, inspected dairy.